It has been an honor to collaborate with Ruth Dwyer this year. 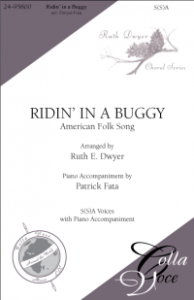 The first result of this collaboration is an arrangement of the American folk song “Ridin’ in a Buggy,” now on Colla Voce. Available for S(S)A or SAB chorus and piano, with optional orchestration for flute, oboe, violin I, violin II, viola, and cello.